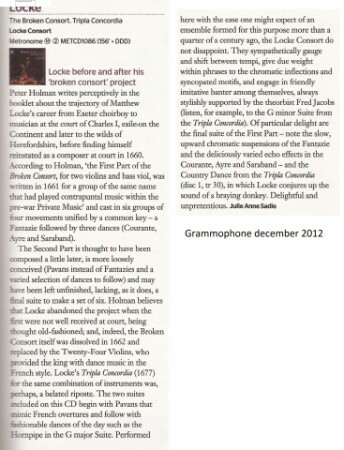 Few ensembles have a better and more intimate understanding of English music than The Locke Consort. Internationally acknowledged for its interpretations of 17th century English music, the consort played a central role in the William and Mary celebrations and the Purcell festivities in 1995. With its rich and luminous sound created by two violins, viola da gamba and theorbo, The Locke Consort models itself on Matthew Locke’s ensemble at the court of Charles II. Combining musicological insight with passionate performance, The Locke Consort's performances and recordings have enthralled audiences and critics worldwide. Their playing is superb, with admirable fire and precision. Delightful music, performed with precision, style and communication of the highest order. The Locke Consort brings just the right mixture of refinement and verve, relishing its eloquent melodic lines, its dramatic strokes, its searching harmonies.